bad coloring, but good picture! awwwwww...sweet little thng. Good job! 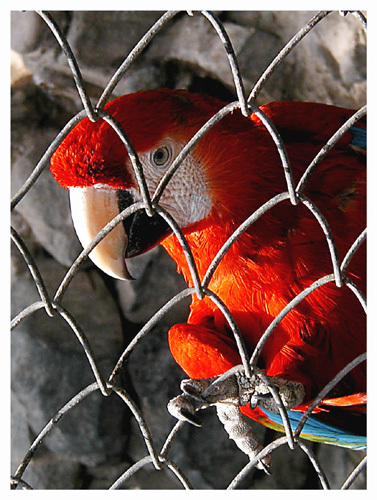 The paw on the cage makes it really look like a jailed bird or jailbird. Good work. Beautiful colors in the feathers of the bird. I really stands out from the background. Great contrast in the shot. The contrast on the feathers of the bird really give you a sense of the layering of the feathers. Also the reflections of the light and shadows in the cage really make it look 3D and helps give it a good depth of field. I love the contrast of color/grey. Great color, I like the detail. This is a good capture and strikes emotion into the viewer. I can't help but feel sorry for it. I love how it's looking at the camera. I'm usually ont a big fan of borders but I like this one here. I'm wondering if a red (same color as the bird) neatline would add anything to this? Congratulations on being one of the few who know what irony means, while making a very visually attractive photo! Well shot, composed. I like the contrast of the brightly colored bird to its dull surroundings - the colors match the substance of the picture, the mood. This is the best photo I've seen so far but I don't find it at all ironic. Proudly hosted by Sargasso Networks. Current Server Time: 04/24/2019 03:52:36 AM EDT.